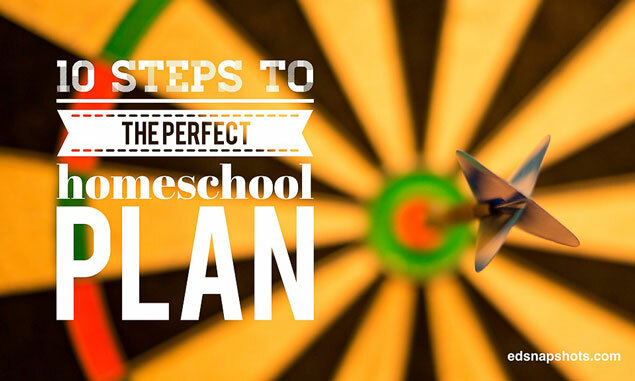 The perfect homeschool plan is not elusive. 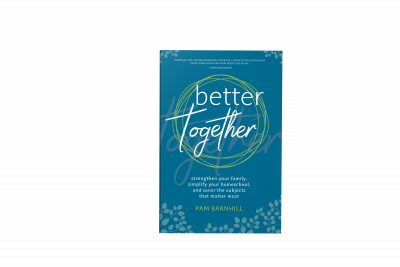 In fact it is easy to create the perfect plan for your family if you begin by considering the needs of your family, considering your limitations as a homeschool teacher, and avoiding common pitfalls. Planning means following a series of prescribed steps that will ensure that you have a plan that is going to work. It may seem time consuming, but none of these steps are particularly difficult to do and the payoff will be a homeschool that will run itself with only a little daily maintenance to keep it going through the year. People ask me how much time I spend planning each week during the school year and the answer is – I don’t. Once the annual plan is in place, all I do is fill out spiral notebooks each day. That takes about five minutes per child. Really! 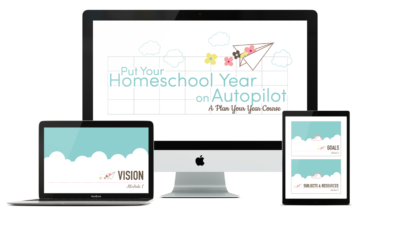 My homeschool runs on autopilot and yours can too. Before you even begin thinking about the other steps of your plan consider what education even looks like at your house. Now that you know what you want education to be, think about each of your children and what you would like each of them to learn this year. Do they need to master math facts, learn to read, learn to write a research paper or a persuasive essay? List those things here to keep you focused in your planning for the year. Once your goals are in place you can turn your attention to which subjects you are going to study this year. List those out per student and start thinking about the curriculum and resources you will buy to study each subject. How many days does your school year need? 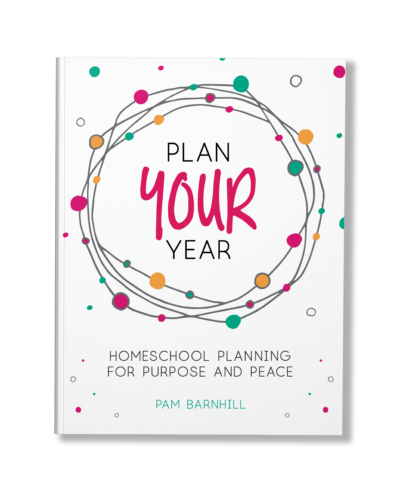 Will you try year round schooling, tidal homeschooling, schooling that aligns with the calendar year? As homeschoolers, we have a number of options for an annual schedule. Once you know your schedule you can begin to plan what a week looks like in your home. Consider your outside obligations. Will you school four or five days a week? Will you do specific subjects on specific days or follow a loop schedule? 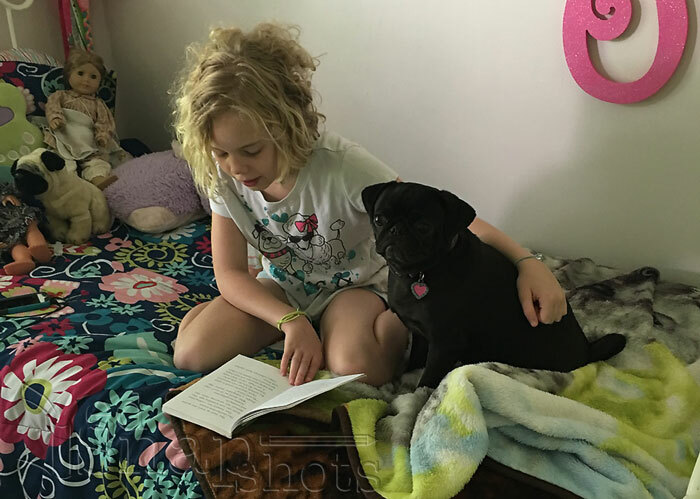 This may be your family read aloud booklist for the year, an individual reading list for each student, or a subject-specific booklist for a particular subject. Finally, we get to shop! 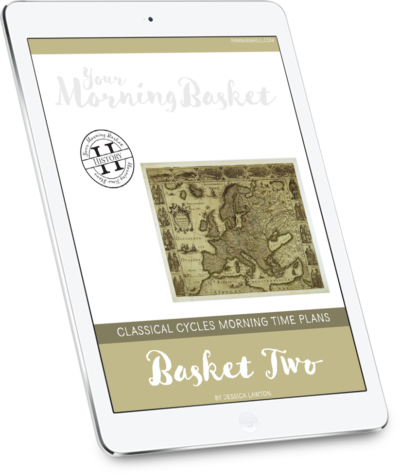 This is the point where you make final choices of purchased and free resources you can use to teach in your homeschool. Now is the time to put the finishing touches on your schoolroom organization and create a space where your family can learn and thrive. This doesn’t mean a Pinterest-perfect space, but instead a space that works for your unique needs. This is the place where you make and file your copies for the entire year so that everything is at your fingertips when you need it. You can also stock up on sketch books, science experiment supplies, and books. How will you keep your records for the school year? Which papers will you save? Do you have portfolio requirements to meet? How will you keep attendance? Thinking about these systems and putting them in place before the school year begins will help make your work easier on the other end of the school year. Now we get down to the nitty gritty of what a day will look like. How early will you start? Will each subject have its own designated time-slot on the schedule or do you prefer to work in generous blocks of time instead? Which subjects will you do each day and how will you contend with challenges like the toddler, the co-op schedule, and getting to piano lessons on time? To help you out I have a downloadable checklist of all ten steps. 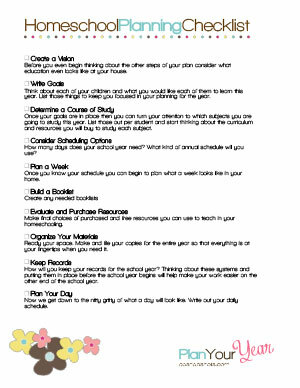 You can check off each one as you work, and put the perfect homeschool plan for your family in place to have a wonderful school year. Get yours now. Please be praying that my husband’s company will move into a higher paying position OR that he will truly embrace me staying home full time and trust God for the rest. You need to plan days — not specific days, but the next day. You need a plan laid out for the year. You can have each day look the same or have A days and B days. Then when you work you go to work, When you come home, you simply do the next day’s plan. If you work two days in a row then the third day you do the next day’s plan. If you don’t work you just do the next thing. Is that making sense? You can still make a plan, but it needs to be a do the next thing plan. I hope that helps. Thanks, Pam! The specific ways that you look at situations are really helpful. Your information came at a good time, as we are almost done with school, and starting to plan for – our first year of high school! (I’m sure it can be done!) That is, once I’ve emptied the drawers of all the non-school papers, (now how do I store them!) and stored all of the books we won’t be using right away! 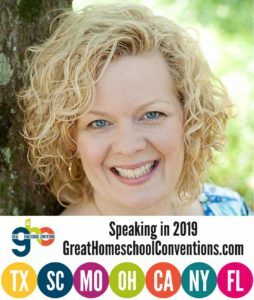 Your information on loop scheduling will be super pertinent this year, as we don’t want to give up the ‘good and lovely’ things which make a home school day fun and unique. Our co-op may not meet for classes next year, so I’m finding it difficult to estimate how much time we’ll have at home vs. other outside classes, etc. Because of this, your block scheduling idea will come into play, too, as that flexible style allows me to shift our schedule at home around, probably many times throughout the year. That’s the only way I’ve found to deal with the snag of unknown monkey wrenches; you can imagine how grateful I am for that bit of sanity-giving advice! Thank you for always serving your family and fellow homeschooling moms. 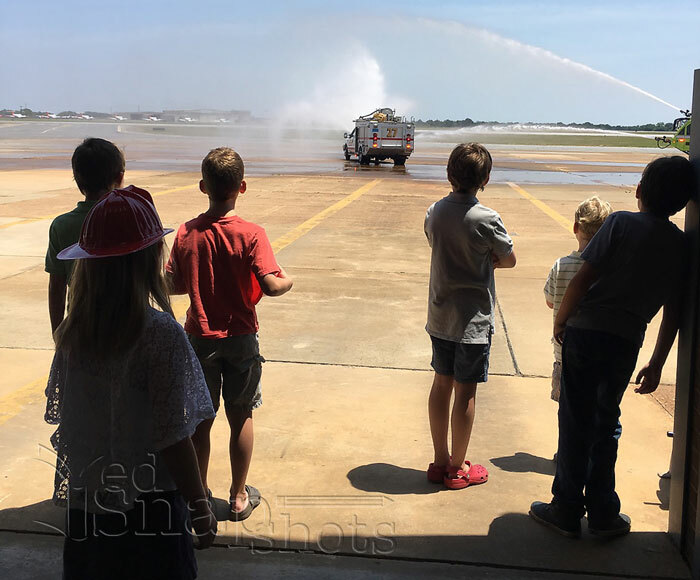 Having been a “fly by the seat of her pants” type of girl, I have failed over the years with my homeschool plans. Your checklist and plans have been a great blessing to me. As a Mom of 4 school age students (ages 6-12) organizing their school work in advance has been overwhelming to me. Please share with me how much time typically it takes for you to complete step 8? Are you able to elaborate or point me to a resource on breaking down step 8? I appreciated hearing this post this morning on The Homeschool Solutions Podcast. We have two children (ages 6 and 2), so we are in our early stages of homeschooling. I’ve been planning this way from the beginning because it just seemed natural to me. (Though I absolutely must credit you and your planning materials for helping us to create a vision. I would have overlooked that step and it was incredibly helpful! We created a long-term vision as well as a goal sheet for the year.) Since our daughter is doing the equivalent of first grade, I was concerned that maybe my our method wouldn’t be robust enough in the older years. I was so relieved to hear that you are doing this with children older than ours – and three of them, no less! Thank you for the work you do. I appreciate your resources and all three podcasts. Hi, Pam, I’m very excited to use the “free Planning checklist”, however, I can’t figure out how to download it. Does it come in an email? Is there a download link on this page? I’m new to homeschool and looking for anything to make it run smoothly for my guy. Thanks so much all your resources. Looking forward to the planning checklist. Yes, Cheryl. You should get an email.